Most Americans who know anything about Latin American history will readily highlight Guatemala in 1954, Chile in 1972 and Nicaragua in the 1980s as prime examples of the United States’ antidemocratic tendencies in the region. A few might even mention Panama in 1903 and 1989, Honduras in 1911, Haiti and the Dominican Republic under Wilson, Nicaragua in 1934, El Salvador in ’44, Cuba in ’61, Brazil in ’64, the D.R. again in ’65, Uruguay in ’73 and Venezuela in 2002. There are countless other instances. I’ve just picked the least disputed. Yet how many people would cite the most recent U.S.-backed coup in Latin America? In the early morning hours of June 28, 2009, soldiers stormed Palacio “José Cecilio del Valle” in Tegucigalpa, detained the democratically elected president of Honduras, Manuel Zelaya (still in his pajamas) and put him on a plane to Costa Rica. Within hours the National Congress accepted Zelaya’s letter of resignation and voted to make the president of the congress and next in line, Roberto Micheletti, interim president—though the deposed president later called the letter dated June 25 a complete fabrication. The military was deployed to secure the streets of the capital city, killing at least 12 people following a severe crackdown. Lines of communication were cut, public transportation halted and a curfew imposed. While I could point to several circumstances showing how what transpired that summer amounted to nothing less than a military coup, I merely need cite the report released by the Honduras Truth and Reconciliation Commission two years after the fact. Reviewing the events leading up to and following Zelaya’s removal from power, the commission concluded that, while Zelaya broke the law by ignoring a Supreme Court ruling against a referendum on a potential constitutional convention, and while the Honduran Constitution lacks provisions for dealing with such a conflict, the National Congress overstepped its authority by removing Zelaya from power. A cable from the U.S. State Department’s own embassy in Tegucigalpa dated July 2009 put it even more plainly. The United Nations, the Organization of American States, the European Union and the presidents of Brazil, Argentina, Chile, Venezuela and Cuba, among others, all called for the immediate restoration of Zelaya’s presidency—all of whom were ignored by the Honduran government. President Obama paid lip service to democracy by verbally condemning the coup, but his administration didn’t go so far as calling it a military coup, a distinction which would’ve automatically forced the U.S. government to freeze all aid to the regime. The reasons behind U.S. support for the results of the coup, if not its means, have been quite clear to this day. Zelaya, elected on the center-right Liberal Party ticket, attracted the ire of Washington when he defected from the neoliberal camp and began buddying up with the Castros in Cuba and the late Hugo Chávez in Venezuela, eventually having Honduras join the Bolivarian Alliance for the Americas in 2008. Other sins leading to his ouster included raising the minimum wage 60 percent, providing free education to all children (including free lunch to the poorest children), reducing poverty by 10 percent during his first two years in office and considering an expansion of the reproductive rights of women. Only weeks before the coup, Zelaya had agreed to review the land title claims of the campesinos living in the Aguan Valley, where currently security forces controlled by a rich landowner are engaged in a campaign of severe repression against the same campesinos. The rich landowner in question is Miguel Facussé, a known narcotrafficker and coup supporter who met with U.S. State Department officials before and after the coup. His security forces conduct their operations in tandem with the Honduran military police, which in term receive its funding and training from (you guessed it) the U.S. government. Oh, what a tangled web we weave, when we give countries over to thieves. Notwithstanding the reasons for the coup, the fact of the matter is that there was a coup in Honduras, one subsequently supported and reinforced by the United States. As Honduras experts like Dana Frank have been pointing out for the past few years, the coup regime that the U.S. government initially pretended to oppose has seen its military police strengthened thanks to increasing levels of aid and training from the U.S. government. President Obama and then-Secretary of State Clinton both endorsed the election of Porfirio Lobo only months after the coup, even while much of the international community deemed it illegitimate and called for the restoration of President Zelaya. The coup regime continues its rule over Honduras to this day in the form of Lobo’s successor, Juan Orlando Hernández. And, again, outspoken criticisms from the likes of Prof. Frank have proven invaluable in their insight, showing how the violence, corruption and impunity already endemic to Honduras before the coup were only inflamed by the coup and the regime that came to power. Be that as it may, whereas most of the finger-pointing has been directed at gangs, the Honduran government, drug users and U.S. foreign policy, I would include yet another culprit: the American people. Yes, the American people are also at fault here—not for something they’ve done, but for something they didn’t do. Namely, they didn’t give a damn. For 100 years the U.S. government and its business interests have preserved their little banana republic in Honduras while the American people have hardly taken notice. When they did notice, it was to mock Honduras’ political prostration, dipping so low as to name a clothing store after it. Even now you can Google the term “banana republic” and the first thing you’re confronted with are ads for polos and chinos instead of discussions on U.S. imperialism in Latin America. 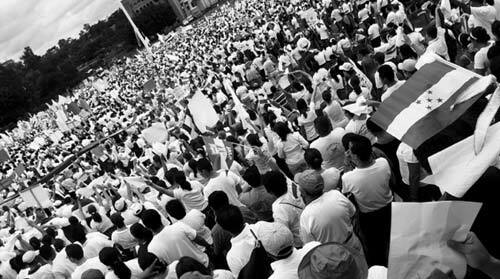 Most Americans were glued to their TVs, computers and smartphones in late June 2009, though few people knew about the concurrent coup in Honduras, much less had an opinion. It wasn’t the death of democracy in Honduras they were concerned about then, but the death of a beloved singer. The international community condemned the coup and called for Zelaya’s reinstatement, while most Americans were completely oblivious to the travesty of justice occurring 1400 miles south of the border, allowing the U.S. government to continue its tacit support of the coup. The international community refused to legitimate the elections that brought to power a political rival of the deposed president, while the American people were focused on a golfer’s extramarital activities, allowing the U.S. government to endorse the presidency of Porfirio Lobo Sosa, whose administration subsequently committed all sorts of human rights atrocities in the name of fighting narcos. Under the banner of the war on drugs, the U.S. government has increased military aid and training in Honduras in the years sincethe coup, providing hundreds of millions of dollars to a regime known to use death squads and attack defenseless campesinos, LGBT rights supporters, child advocates, political opponents and other critics of the regime. All the while the American people never paid Honduras any mind, which ensured that the U.S. government would never be held accountable for any of it. To their credit, some members of Congress have voiced their concern over what’s happening in Honduras, even before 13,000 Honduran children seeking asylum showed up at the Rio Grande. Still, it’s clear that the current refugee crisis was made possible only by the complete and willful ignorance of the American people. I say “willful” because most Americans have purposefully avoided learning anything about Central America, much less Honduras. The military coup came and went, and most Americans viewed it as they do disturbances in Sub-Saharan Africa — being of no importance or consequence to the United States and its way of life. That’s how much of American foreign policy operates: out of sight, out of mind. Now that conditions in Honduras have placed the country directly in sight of most Americans, suddenly everyone’s deeply concerned, wondering why and how. Now every newspaper and talk show is decrying the tragedy that is Honduras. Which brings me to the last issue that needs to be cleared up. Take it from the son and grandson of Honduran immigrants, the people of Honduras are not “backward.” That’s not why their government is evil, why violent gangs control their neighborhoods, and why women and children are fleeing by the tens of thousands. If Honduras seems “backward,” it’s only because it’s been kept back by the U.S. government and U.S. business interests, which have overthrown the sovereign will of the Honduran people whenever promising reforms were on the horizon. Between the U.S. government, the American people and the Honduran government, I place the least amount of blame on the “thugocrats” in Tegucigalpa, because as the coup and the United States’ increased aid and training have shown, the Honduran government is only capable of doing what the U.S. government allows it to do. And the U.S. government is only capable of doing what the American people allow it to do. If not, then the current state of democracy in the United States is no better than it is in Honduras. But if the U.S. government is still answerable to the American people, then shame on them for looking the other way while their government subverted democracy in Honduras for so long. And shame on them if they even consider turning their backs now on the children they’ve left nationless.